The unique exotic Bhutan experience began even before we arrived in Bhutan. I believe many of the travellers on the same flight to Bhutan felt the same way. 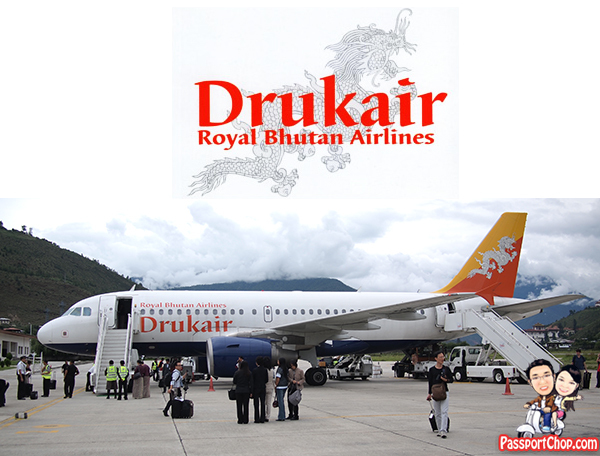 Besides the private Nepali airline, Buddha Air which flies into Paro (Bhutan’s only international airport) only from Kathmandu (Nepal), Druk Air is the only one providing connections into Bhutan from international destinations i.e. Kathmandu, Bangkok, Kolkata, Bagdogra and New Delhi. Due to the small size and capacity (holds 20 Business class seats and 94 Economy class seats) of Druk Air planes (Airbus A319), travellers have to be shuttled by buses to the planes instead of using aerobridges. This itself provided lots of photo opportunities for travellers as they went camera-crazy (ourselves included) on the Druk Air plane and its flight staff who were like celebrities at that point in time. Inflight amenities onboard Druk Air – there are no inflight entertainment available: no individual TV screens at the back of the seats or a big screen in front. Considering that the journey from Bangkok to Paro (and most other destinations to Paro) is less than 3 hours, the lack of inflight entertainment is no huge loss since the flight time is too short to catch a full movie anyway. However the inflight magazine, Tashi Delek is quite interesting and provides readers with a quick glimpse on what to expect for travelling in Bhutan and other interesting sights through stories from Druk Air editorial team as well as contributions from other travellers. The seat pitch for economy class seats is quite generous at 32 inch – comfortable even for myself (at 1.75m tall). For most Singaporeans who have been travelling on budget airlines around the region, this plane might seem similar to those flights but the key difference is that you can recline a lot more (compared to budget airline flights) and there are meals served onboard (included in your air ticket price). 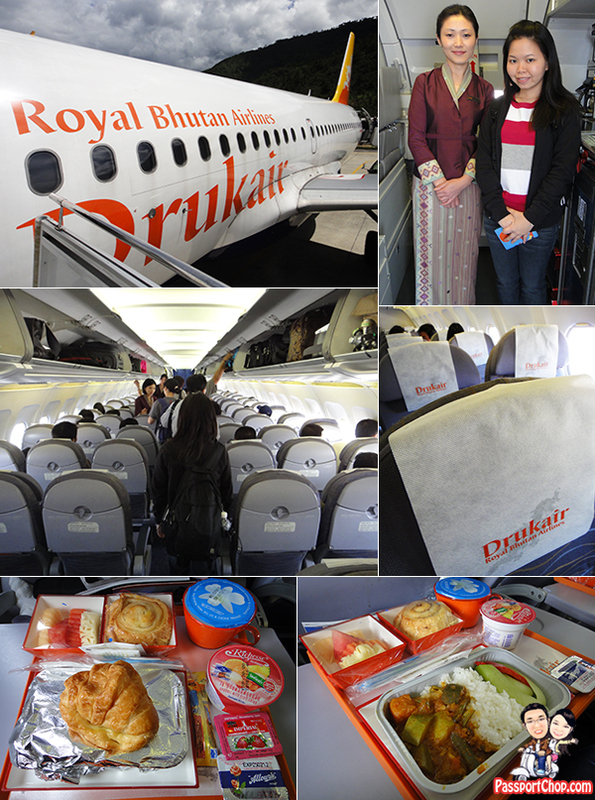 We have all tried our fair share of bland tasteless airline meals but what’s on offer by Druk Air was one of the best airline meals we had ever tasted! Typically, travellers get a choice of a vegetarian dish (usually cooked in Bhutanese-style *meaning spicy*) and Western dish – the selection will depend on the time of the day – morning breakfast is usually omelette and sausages; afternoon lunch will usually be chicken pasta. Our Druk Air culinary experience began at the warm and sweet butter bread right on top of your main course – this could be eaten on its own or with the sweet strawberry jam provided – the bread tasted great on both flights to and fro Paro (or perhaps because we were hungry so anything would have tasted great :-)). The main courses were just as good – on our return flight, I tried the vegetarian dish cooked in Bhutanese style – rice with mushrooms and vegetables cooked with chili cheese – much better than some of the Bhutanese meals I tasted on land! Even after an onslaught of Bhutanese food for lunch and dinner continuously for the past 4 days, I did not regret my choice of this meal onboard! One point to note is that the Western airline meal served onboard Druk Air was a bit bland – would need to add a bit of salt and pepper to bring out its flavors. Alright! Enough about the food! The Bhutan experience I mentioned earlier about it beginning even before we set food in the country, holds true even for the flight itself! At just about 30 minutes prior to landing at Paro airport and as the Druk Air plane starts to descend from the clouds, you will get a view of the beautiful serene Himalayan mountain ranges – i think this rare perspective of viewing the mountains from above them would have more than justified for the Druk Air fares – to get such a view, other travellers might have to pay hundreds of dollars for a private charter plane (if weather permits) up to this height. For the best views of this landscape and to take the best pictures/videos, you will have to check-in early for your Druk Air flight and reserve your seats on the left hand side of the plane if you are flying in from Bangkok. On your return flight, request for a seat on the right hand side of the plane to get the best views as the Druk Air flight departs Paro. Seats are allocated on a first come first served basis. For a quick glimpse of the views you can expect to see during your flight into Paro, check out the video prepared exclusively by PassportChop.com. The Paro Airport is a very interesting sight by itself – with just 6-8 flights arriving at the airport daily – each flight is received with much fanfare – not the welcome dance or garland hanging type but in the form of the entire airport staff being activated to serve the plane in every aspect from immigration customs, security to baggage handlers. But unlike other airports, the travellers ain’t rushing to clear immigration and customs – instead they could be seen roaming around the plane taking pictures of the interesting architecture of the airport building and the plane and pretty much everything around the surroundings. The airport staff and security will not be rushing you off as they know that the next flight is a few hours away. If there is one thing you need to rush for, (for ladies only) it is the ladies toilet – there is only one before the immigration clearance and there will definitely be long queues. The processing at the immigration counter is quite straightforward as your visas would already be verified at the airport where you boarded Druk Air flight. The immigration officers speak good English and are generally quite polite. Considering that there is only one planeload of tourists to clear (less than 100), the process is quite quick. After clearing customs, the money exchange counter is located at your right. Exchange rates are listed on the board and is generally the same throughout the country (even at the hotels). There is however one bizarre practice which puzzled me – there are different rates (less favorable) if you change less than 50 USD. Thus if you are planning to change 70 USD and you handover a 50 USD and 20 USD note, you will be informed that different rates will be applied to these 2 notes (with the less favorable rate being applied to the 20 USD note). Considering that most expenses e.g. hotel, transport, food, guide would already have been arranged for prior to the trip, there is no need to change too much money – generally 50 USD would be sufficient for one person for a 5 day trip – just for snacks, drinks and souvenirs. 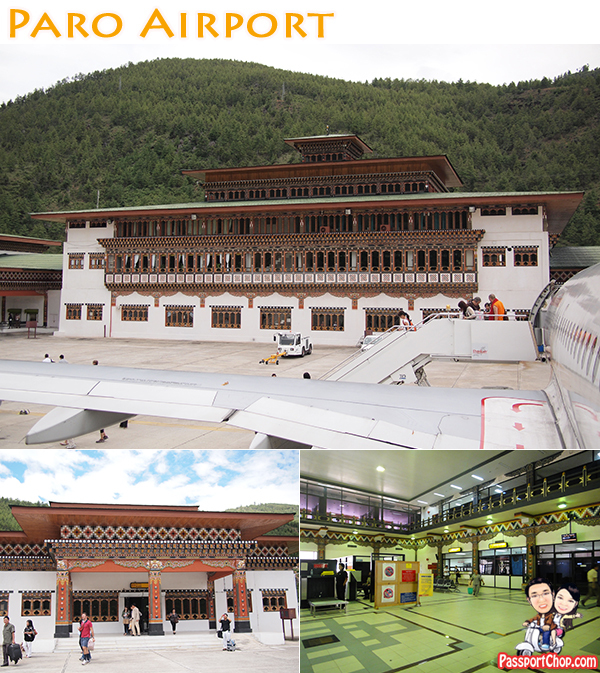 Paro is the only airport in Bhutan and it is located in a deep valley at an elevation of 7300 ft above sea level. The surrounding hills are high as 16,000 ft and approach into Paro airport is entirely by visual flight rules. That means no flights can be operated at night or in poor visibility, so when Paro valley is clouded in, flights are delayed, sometimes for days. – You reconfirm your Druk Air flights before departure and also once in Paro, to ensure that the schedule has not changed. At Paro, usually your tour guides will do that for you. – Check in early for Druk Air flights as they occasionally depart before the scheduled time, especially if the weather starts to change for the worse. – Flights may be delayed because of weather and Druk Air recommends that you travel on nonrestricted tickets and allow at least 24 hours’ transit time with you connecting flight in order to minimise the complications of delays. You can set aside a few days for sightseeing in Kathmandu or Bangkok depending on where you are arriving at. Thks for the useful info I am planning for a trip to Bhutan. Thks for clearing up the myths. My wife feels more assured now. I will contact Drukasia soon to make my booking! Both services are equally good. =) I was quite surprised that the Drukair air stewardess speak fluent in English as she was the 1st Bhutanese I interacted prior reaching Bhutan. Amazing airport, there building it’s look like a temple.. I was just searching for this info for a while. After six hours of continuous Googleing, finally I got it in your website. I wonder what’s the Google’s problem that does not rank this type of informative sites closer to the top. Usually the top websites are full of garbage. I was just looking for this information for a while. After six hours of continuous Googleing, finally I got it in your site. I wonder what is the Google’s issue that does not rank this type of informative sites closer to the top. Generally the top sites are full of garbage. sounds like an incredible travel trip. I’d love to determine more pictures. Our next vacation is in 7 month so i can only read and dream of travelling through the world right now. Ye got on this website article. I hope I can get a lot more material on its website . I will come again . I adore this weblog layout . How do you make it. It’s rather cool. wow, impressive, the airport looks so nice. I can already tell the many beautiful scenery that awaits me. I had been disappointed with most of the meals served in planes. So you’ll understand how good I felt when you mentioned the food. The subsequent time I learn a weblog, I hope that it doesnt disappoint me as a great deal as this one. I imply, I do know it was my option to learn, nevertheless I actually thought youd have some thing interesting to say. All I hear is really a bunch of whining about some thing which you could repair for those who werent too busy on the lookout for attention. We dont ordinarily comment however i gotta say respect for that post about this one. Among the finest to inform you that I am just brand new in order to blogging and certainly loved you are website. Probably Im going to bookmark your website . You certainly possess exceptional posts. Kudos with regard to discussing around your blog. I’d figure out your blog the actual dreamland! Whilst Santa claus knocks from our door soon after per year, a person weblog is open up the complete year D amazing! I must voice my passion for your generosity giving support to persons that actually need assistance with in this area. Your special commitment to getting the solution throughout had become exceedingly interesting and have continually enabled workers just like me to reach their goals. The warm and friendly guidelines entails a lot a person like me and additionally to my office colleagues. Regards; from all of us. I just want to inform a person that I am simply brand new to blogging and definitely loved you are website. Most likely I will bookmark your website . You certainly possess exceptional articles. Kudos for discussing around your blog. I love whenever you discuss this kind of stuff in your weblog. Possibly would you continue doing this? I am extremely influenced together with your website as wisely with the framework to your weblog. keep up the superb high quality composing, it is unusual to determine a great weblog like this one nowadays. Hi there! Wonderful things, do let me know whenever you publish once again something like this! Great internet site. A lot of handy info in this article. I’m mailing it to some friends and also posting in scrumptious. And of course, thank you for your work! Hello! I simply want to provide a large thumbs upward for the good data you will have right here about this publish. I will likely be coming back to your blog for extra quickly. To begin with, I wish to thank you in the outstanding together with educational access. I will have to admit which usually, We havent noticed relating to this info. We have noticed quite a few new information for reason. Thanks a lot with regard to giving this particular effective and interesting information. We are waiting around regarding additional thrilling posts due to you from the nearest long run. Ha ha… I was just browsing around and took a glance at these responses. I can’t believe there’s still this much fascination. Thanks for posting about this. Identified your short article really intriguing certainly. I truly liked reading it so you make really some fantastic details. I’ll bookmark this internet site for your future! Relly great write-up. I just returned from Bhutan trip, unparalleled experience, would love to return at the first opportunity. Will anyone enlighten me about a Himalayan peak (name and altitude) visible on the star side during the Druck Air flight from Paro to Bagdogra.